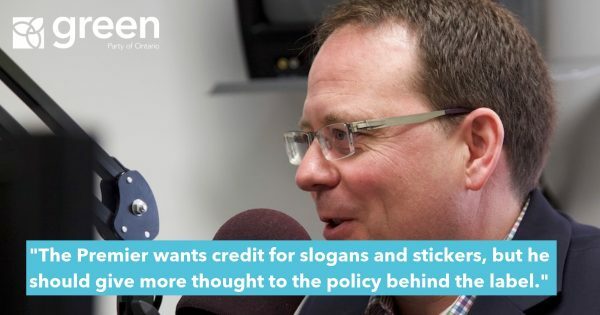 (Queen’s Park): Green Party of Ontario leader Mike Schreiner is pushing Premier Wynne to take a firm stance against Enbridge’s Line 9B oil pipeline. 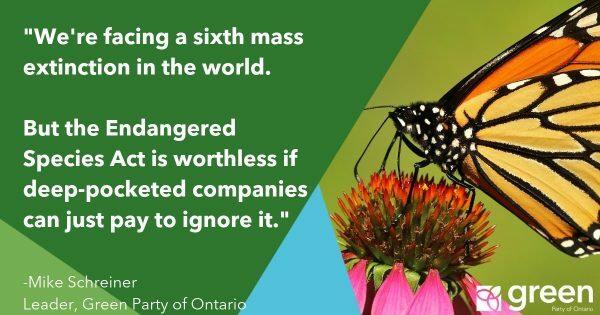 Over 570 Green Party supporters have sent the Premier a letter asking her to say no to Enbridge’s Line 9B proposal, which is currently before the National Energy Board for approval. The Green Party is particularly concerned with Enbridge’s proposal to ship dilbit–raw tar sands bitumen mixed with chemicals–through a 38-year-old pipeline not designed to handle such corrosive material. Enbridge’s Line 9 runs between Sarnia and Montreal under every major river in Southern Ontario, prime farmland, sensitive ecosystems and populated urban areas. U.S. studies show that pipelines shipping dilbit are more likely to spill because it is more corrosive than conventional crude. Tar sands oil is also harder and more expensive to clean up. Clean up of the Enbridge Line 6B dilbit spill in Michigan is still not complete after three years and over $1 billion in cost.